Among other things, I'm currently working on another pair of gentlemen's socks. These ones are inspired in equal parts by Glen Duncan's brilliant novel I, Lucifer and its equally brilliant companion soundtrack by The Real Tuesday Weld. This will be my third design inspired by TRTW, for those of you who are keeping track. 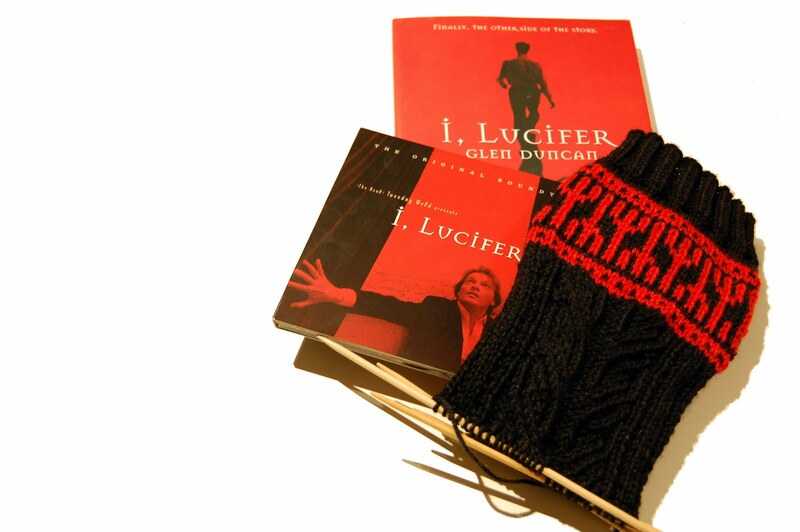 Knit in a black and scarlet wool/silk blend and featuring stylized, Art Deco-inspired motifs these are the ideal socks for any gentleman of wealth and taste. They're called "Socks for Declan," after (one of the incarnations of) the protagonist of the book, the writer Declan Gunn. With any luck these finished socks will be turning up in the Antique Beat Boutique in the future. I will keep you posted. Rest assured that no one made me do this -- it's all me. March 3, 2011 at 12:57 p.m.
March 3, 2011 at 3:07 p.m.
Gorgeous, witty and warm Jane -as ever! March 3, 2011 at 6:41 p.m. Thanks so much, Stephen -- I was hoping you'd like them! March 3, 2011 at 7:20 p.m.
Hey! Thanks for linking to Antique Beat...had never heard of it...and I love to discover new stuff! Very cool! March 3, 2011 at 7:45 p.m.
Tamara -- glad you like it. It is one of my favourite sites and the only place I sell my finished socks online. They have lots of other wonderful things there, too. March 3, 2011 at 7:51 p.m.
holy smokes look at those cables! I really love the punch of color on the cuff. March 3, 2011 at 11:27 p.m.